Erdoğan has accused Gulen of attempting to undermine the Turkish government. Gulen’s followers control many Turkish institutions, including the media, courts, and police force. In addition to muddying that complex geopolitical dynamic, a 2009 email recently released by Judicial Watch provides yet another example of access being provided to a Clinton campaign and Clinton Foundation donor. A 2011 New York Times article focused on suspicious ties between Gulenist schools operating in Texas under the name Harmony Public Schools. Harmony contracted with a company controlled by a pro-Gulen non-profit called the Cosmos Foundation. In 2002, Aslandogan purchased property that was later sold to Harmony. He also founded the Texas Gulf Foundation, which has also been awarded taxpayer-funded contracts to provide services to Gulen schools. Aslandogan did not return a request for comment. Nor did Ozkok, who has affiliations with Gulen-connected education firms Sema Education and Apple Education Services. The partnerships between the schools and contractors allow taxpayer funds to remain within the Gulen network. Teachers at the schools, many of whom are not fluent in English, are also used to help finance Hizmet, according to one former teacher at a Gulen institute. The teacher, who is now a government whistleblower, told “60 Minutes” in 2012 that Turkish teachers are required to return a large portion of their salary to the Gulen network. She said that her Turkish husband, who taught at one of the schools, was required to return 40 percent of his salary. Accusations of visa fraud and other impropriety, which Gulenists largely deny, have contributed to an increased profile for Gulen, who ended up staying in the U.S. permanently after coming here for medical treatment. Erdoğan’s campaign to rid Turkey of Gulen’s influence has also thrust the recluse onto the public spotlight. On top of his efforts to crackdown on Gulenists within the Turkish media, judiciary and police, Erdoğan has sought to exert influence over Gulen in the U.S.
During a 2014 visit with President Obama, Erdoğan, who served as prime minister prior to his presidential term, reportedly asked Obama for Gulen’s extradition. The Turkish government has also retained the law firm Amsterdam & Partners in an effort to undermine Gulen and Gulenists in the courts as well as the media. The connections between the Gulen movement and Clinton are not the first to be revealed. They also add to questions about what it is the Gulenists want from Clinton and whether the Democrat has rewarded their financial support with favors. Last year The Daily Caller reported that numerous Gulen followers have donated to Clinton’s various political campaigns and to her family charity. One Gulen movement leader, Recep Ozkan, donated between $500,000 and $1 million to the Clinton Foundation. 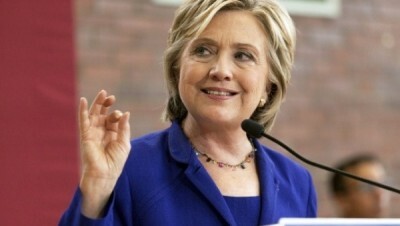 As senator from New York, Clinton gave a keynote address at the Turkish Cultural Center’s annual banquet. The email to Abedin, which is the first piece of communication showing that a Gulen follower had direct access to Clinton’s staff, sought a favor. “Please tell Madam Secretary that it would be great if President Obama can include a 15 minutes [sic] meeting with Ekmeleddin Ihsanoglu, Secretary-General of the Organization of of [sic] the Islamic Conference (OIC), in his trip to Turkey,” wrote Ozkok. Some terror watchdog groups flagged the meetings, pointing to Ihsanoglu’s past praise of the terrorist group Hamas and for Sudanese president and U.S. foe Omar al-Bashir. 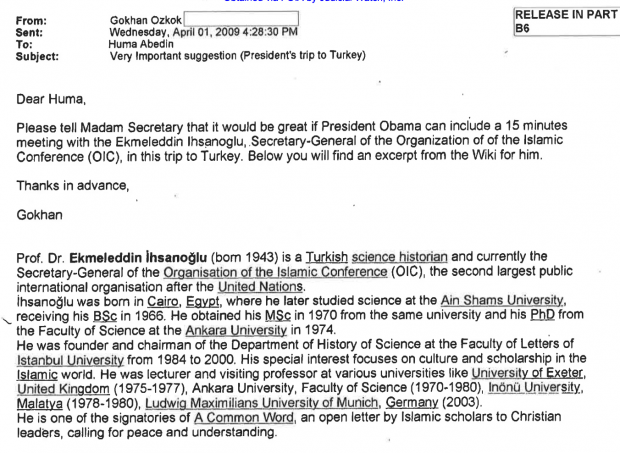 But Ihsanoglu does not appear to be a radical firebrand like so many Islamists in the Middle East.It is unclear if Abedin forwarded Ozkok’s request to Clinton or anyone else in the Obama administration. But Ihsanoglu, who is an ally of Gulen’s and lost to Erdogan in the 2014 presidential election, did meet with Obama in Istanbul several days after the email. There, Obama reportedly extended an invitation to Ihsanoglu to visit the White House. The academic visited in June 2009 and reportedly asked Obama to create a U.S. ambassador to the Muslim world. As for the Podesta Group, the lobbying firm has connections to several controversial companies seeking to peddle influence at Clinton’s State Department. Daily Caller investigations have revealed that the Podesta Group has represented Uranium One, a Russia-controlled uranium company that had ties to Canadian mining magnate and Clinton Foundation philanthropist Frank Giustra. The Podesta Group also lobbied Clinton’s State Department on behalf of BAE Systems just as the U.K. defense contractor was facing stiff government sanctions for illegal arms trading. The Associated Press has sued the State Department for records pertaining to discussions to let BAE Systems off with a slap on the wrist for its infractions. Clinton’s favorite lobbying firm also started working last year for Islami Bank Bangladesh, a Bengali bank that has been linked to terrorist groups. And earlier this year, Tony Podesta, the Clinton bundler and Podesta Group principal, was hired by the Saudi government.